Are You Looking For A Better RV Mattress? If you ask most new RV owners how they feel about the mattress that came with their brand-spanking-new RV you will likely hear a moan, groan, or some other unsatisfactory sound. Amazingly, RV’s that can cost upwards of $200,000 are likely sporting a cheap mattress (often times made in China) that cost the manufacturer less than $50.00. How do I know this? My company, Rocky Mountain Mattress, occasionally attends RV shows around the U.S. and I have had many discussions with many different RV-manufacturer-folks about their beds! The good news is that you can effectively and affordably correct the situation with a little know how. Your first step should be to determine whether the bed can be made comfortable with a quality mattress topper. If you decide that you can salvage your ability to sleep by investing in a topper you need to now determine whether that topper should be made from a quality memory foam or latex. This infographic we designed might be helpful in making that choice http://www.rockymountainmattress.com/faq/memory-foam-vs-latex.php. There are a lot of companies that will also be willing to custom cut your topper to fit an unusual RV mattress shape or size. My company will cut the foam for free and charge a small fee for customizing the mattress topper cover if you‘d like one, and we even offer free delivery for all orders within the United States! If you decide that the mattress topper will not cut it, then custom making a new mattress means you can have the comfort, support, durability, and size that you need in a mattress for your RV. When it comes to what will fit in your space, it’s just a matter of taking some relatively simple measurements or contacting your manufacturer for a schematic (see instructions for working with Airstream here http://www.rockymountainmattress.com/faq/how-to-get-an-airstream-schematic.php). When it comes to comfort and your preferences, then you need to choose which types of materials will be best suited for your needs. There are a wide variety of materials to meet your custom mattress needs, including memory foams, Dunlop and Talalay latexes, fabric options (CoolMax by Dupont, organic cotton, bamboo, etc.) and more. Now, if this is your first custom mattress purchase all of this information may be very overwhelming. Let’s discuss a few key things to remember when deciding on materials. First, it’s important to remember that you purchased an RV for the sole purpose of taking the comforts of home with you wherever your travels may lead. This is why it’s important to have the proper support for the many pressure points along the body. You will also want a mattress that will last you a long time and be durable. The most durable of materials is natural latex. This material often lasts the longest, (up to 20 years) and has an outstanding elasticity that will give great support while you sleep. It’s eco-friendly as well! After being introduced to the market in the early 90’s, memory foam has become widely popular and for good reason. It’s excellent for its supporting qualities with a unique ability to absorb and support pressure only at the site of the pressure. Memory foam supports your body only where it’s needed reducing the amount of pressure forming elsewhere. When pondering whether to keep your house or sell it as you transition into full-time RVing, there are a number of factors involved, and a number of questions to ask yourself to help decide if you should keep your house, or sell it. Ask yourself, do I need the money from selling my house to support my full-time RVing lifestyle? Do I make enough money to support both a house and a full-time RV lifestyle? 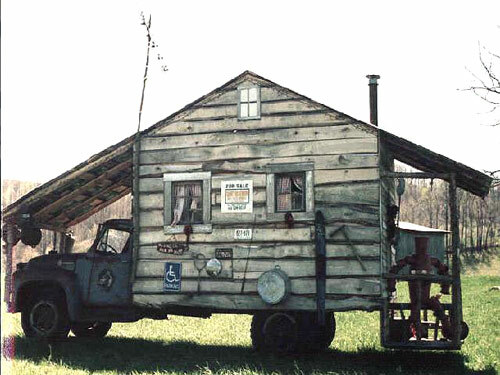 Can I rent the house while RVing? Do I have a large enough parachute in case something negative happens to the house or RV while on the road? Are market conditions good for me to sell the house? Am I 100% confident in the lifestyle choice? If not, can I afford a trial period of 6 months or 1 year of RVing? Will I return to the same town regularly? Can I get used to sleeping in a different place every night, albeit in the same bed? Do I have a comfortable home made in the RV? Once you’ve asked yourself these questions, if all signs point to ‘sell’, give it another few months to be 100% certain in your choice. After that, happy RVing!! 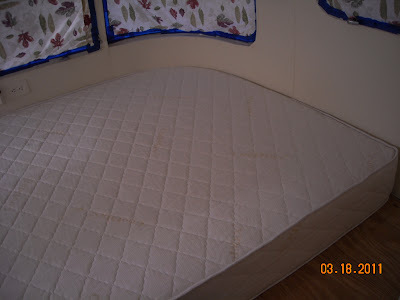 We talk to full time RV’ers every day who would like a Rocky Mountain Mattress RV mattress. It is always fun to see pictures of our customers and their RV’s (and no, we have not serviced the “homes” you see here). We’re sure this is a perfectly comfortable, normal RV. However, I don’t think I could sleep comfortably at night knowing that a 20-foot cow was perched somewhere above me. Especially one with such a creepy look on its face. We received our mattress on time as promissed and are extremely pleased with it. It was a custom mattress for an RV that had to fit within a totally enclosed space – and it fit perfectly. We would like to thank RMM for their great service and all the folks that helped us at Rocky Mountain Mattress.